Na Mohamed Salah from Egypt dem vote as BBC African Footballer of di Year 2017. After voting wey be one in town, na di Liverpool striker carry am on top di head of Pierre-Emerick Aubameyang wey from Gabon, Naby Keita from Guinea, Sadio Mané from Senegal and Victor Moses from Nigeria. "I dey very happy say I win dis award," na wetin di 25 year old bin tell BBC Sport. "E get special feeling wey you dey get when you win something. You go feel like say you do better dat year, so I dey happy, I go like to win am again next year!" Salah, wey be di Premier League top scorer with di 13 goals wey im score, don enjoy better year for both im club and country. For di beginning of 2017, na im carry Egypt as dem finish second for di African Cup of Nations. As di year dey waka dey go, na im put hand for inside seven of di goals wey carry im country enter dia first World Cup since 1990, as im assist for two of di goals and score di remaining five goals. "I wan be di best Egyptian na why I dey work hard," na wetin di man wey be di third Egyptian to win di award, and di first wey don win am since 2008 talk. "I dey always follow my way, and I wan make people for Egypt follow my way too." Salah for im club don do better as im dey do for im country. For Italy, im score 15 goals, come put hand for 11 more and im help Roma come second for Serie A. Dis na di best rank wey dem don get for seven years, before e enter Liverpool where im score 13 times for di 16 games wey im show face. "I go like thank my team-mates (for Liverpool) and I bin get better season for Roma, so I get to thank my teammates for dia and my teammates for di national team," na wetin Salah talk. "Since I come here, I bin wan work hard to show everybodi my football. I wan enter Premier League since I comot, so I dey very happy." Salah don dey show imself for Premier League for dis season if you compare am to how e bin dey for Chelsea for 2014-15. "E deserve am wella," na Liverpool coach Jurgen Klopp talk dis one. 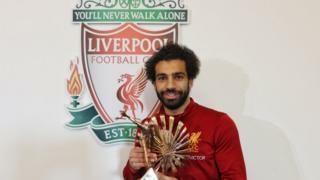 Na im give Salah di trophy for di club Melwood training academy. "I get better luck. I get chance to work with better-better players and I dey happy say I dey with Mo. "Di good thing be say im dey young and room dey make to improve, e get potential wey we go work on, but na how e suppose be. Honestly, na big pleasure say I dey work with am." Salah go add im name join African Legends like Abedi Pele, George Weah, Jay-Jay Okocha and Didier Drogba wey don carry di BBC African Footballer of di year prize. "I dey happy well-well to join dem unto say I win dis award," according to di Egyptian wey follow im follow Egyptian Mohamed Barakat (2005) and di oga Aboutreika (2008) to collect di trophy.